The island is located in the Outer Hebrides which are a group of islands that lie just off the north western corner of Scotland. 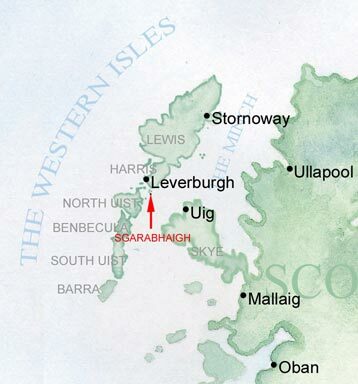 Sgarabhaigh (pronounced Scaravay) is to be found at the eastern end of the Sound of Harris that in turn lies about half way down the 150 mile long chain of islands. It can be located on most reasonable scale maps.